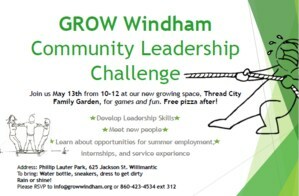 “Community Leadership Challenge” which will be held on Saturday, May 13th from 10-12:30 at our community garden in Philip Lauter Park, Willimantic. We are inviting high-school age youth from area schools, so that participants may have the chance to meet new people, develop leadership skills, and learn about opportunities for employment, internships and community service. 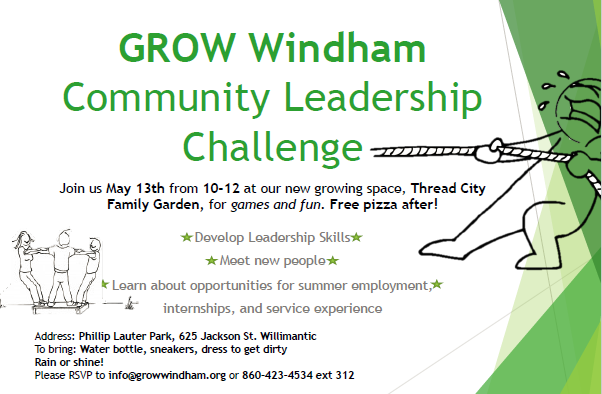 Saturday, May 13th from 10-12:30 at our community garden in Philip Lauter Park, Willimantic. Our expectation is that this will be a small group, and the first step toward building a network of engaged youth, teachers and programs from the area, through which youth can learn community-building skills and be inspired by one other.